A transition to team-based care and collaboration among health care providers at different levels can be challenging to implement. Successful team-based care requires understanding both how professionals of different disciplines can deliver complementary care and logistic considerations, which include insurance coverage, copays, flexibility of appointment times, patient transportation, and more. Communication among the team is essential to ensure continuity and optimization of care, especially when providers do not have a common electronic health record system. 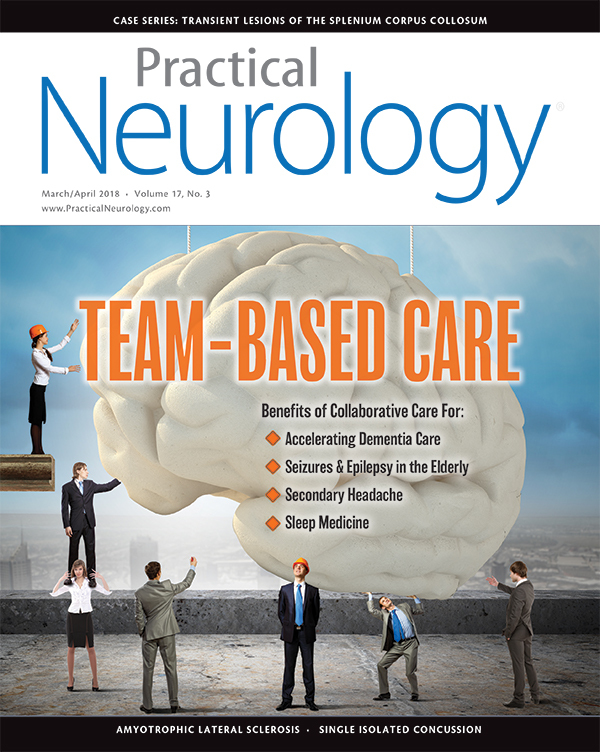 Team-based care, as it is addressed in this issue of Practical Neurology, includes neurologists working with primary care physicians, neurology subspecialists, physicians from other specialties, physician assistants, nurses, dentists, pharmacists, technologists, and other medical professionals. We begin with A. M. Barrett, MD and the 2016-2017 American Academy of Neurology Transforming Leaders Group who address the changes in neurorehabilitation for patients with spatial neglect in The Speed of Trust Advances Treatments. Jonathan H. Smith, MD discusses the differential diagnosis for patients presenting with headache and when general neurologists should seek consultation with a specialist in Ruling Out Secondary Headache. Seizures and Epilepsy in the Elderly by Rani A. Sarkis, MD and Matthew Schretter, MD covers how an general neurologist and/or an epileptologist can work with a primary care physician to ensure comorbidities in elderly patients with epilepsy are not neglected. David S. Geldmacher, MD and Giovanna Pilonieta, MPH, DDS discuss barriers to collaborative care for patients with dementia in Accelerating Dementia Care. Two articles, by Paul R. Carney, MD; James D. Geyer, MD; and Monica M. Henderson, RN, RPSGT, and by Steve Carstensen, DDS, DABDSM, address interdisciplinary collaboration in sleep medicine and dental sleep medicine. Allen Gee, MD and Alannah Gee share ideas for telecollaboration in areas without pediatric neurologists. Paul Christo, MD, MBA shares his perspective on how neurologists can address pain in the context of the ongoing opioid crisis. 1. Wagner E. The role of patient care teams in chronic disease management. BMJ. 2000;320(7234):560-572. 2. Carter BL, Rogers M, Daly J, Zheng S, James PA. The potency of team-based care interventions for hypertension a meta-analysis. Arch Intern Med. 2009;169(19):1748–1755. 3. Hunt JS, Siemienczuk J, Pape G, et al. A randomized controlled trial of team-based care: impact of physician-pharmacist collaboration on uncontrolled hypertension. J Gen Intern Med. 2008;23:1966-1972. 4. Shojania KG, Ranji SR, McDonald KM, et al. Effects of quality improvement strategies for type 2 diabetes on glycemic control: a meta-regression analysis. JAMA. 2006;296(4):427-440. 5. Gilbody S, Bower P, Fletcher J, et al. Collaborative care for depression: a cumulative meta-analysis and review of longer-term outcomes. Arch Intern Med. 2006;166(21):2314-2321.